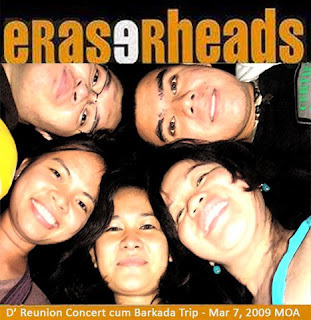 Last Saturday after my MIT class, I drag myself to Mall of Asia to watch the Eraserheads Reunion Concert. It starts at 8 pm and we entered the open field at around 8:15 – die-hard fans are already at the area as early as 3:00 pm, so it’s like there was no room for us anymore. We tried to squeeze ourselves into the crowd to get a view of, hmmm, just the wide screen for a 300-peso ticket - got pushed and we push back, got soaked with sweat, practically eat dust and almost died of suffocation. We tried but sadly didn’t make it to get a good view, towering Smart tents and stinking portalets are blocking the screen. So we decided to settle in at the gate area under an unknown tree together with all those bored looking students and a lot of dating couples, hugging and touching like it was a valentine concert. This is just my personal opinion – the concert lacks the pumping energy I’m expecting. It is not because we don’t have a good view of the stage – but maybe because of the boring 30-minute commercial break or maybe because I’m still suffering from last night’s hang-over or maybe Ely is sick. I don’t know but the concert lacks spontaneity. Thanks to the fireworks! 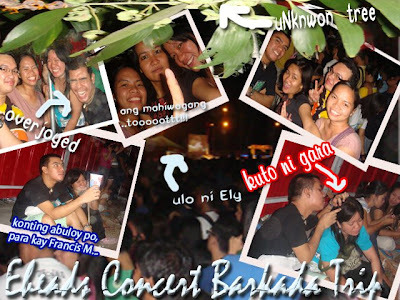 Hey look at this guy, he paid 300 bucks just to sleep in Eheads concert, har har.. nice trip. Siyempre papatalo ba naman kami. May sarili din kaming trip, eto o… we he he.